Having laid the first foundation in the year 1977 and as of today the point it reached, the defence industry taking the first place, operating the aluminum casting and production and marketing activities aimed at their procession, ALTUN DÖKÜM, is keeping its activities in its sector with rapid development trend and within an institutive development period. 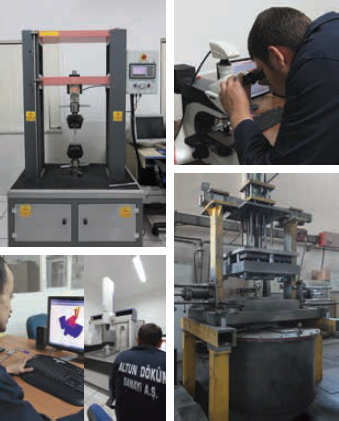 With its squad working professionally for more than 35 years concerning the production adventure, within the context of Total Quality Sensibility, assuming all as a whole from material quality to transportation, technologic standarts to employee quality, Altun Döküm, is applying a process which is extremely developed and possessing international accredition. Adopting the quality as a life style ALTUN DÖKÜM SAN. A.Ş. has been awarded with ISO 9002:1994 document in the year of 2001 and ISO 9001:2000 in the year of 2003 from RW TÜV. By the ISO 9001:2008 document taken from TÜV NORD in the year 2009, the present faith of customers has been consolidated. Our company which is positioning the human and the responsability to it to the first place, is also experiencing the well-deserved honor of the contribution it made to the country's economy by means of its exportations it realized to most countries of the world and transporting the ALTUN DÖKÜM quality to outside of the country borders. Our company will carry out its studies with an increasing acceleration as well, through the product and approach difference and the responsibility understanding it brought from now onward. is to carry on our quality understanding, capacity and activity by developement; to be a pioneer industry establishment serving the sustainable development of our country by fulfilling the expectations of our customers with the technology we have. is to be an establishment which is meeting our customers' expectations, open for improvement and contributing the production of the country in a competitive quality and minimum cost maximum production by means of using the sources we have effectively.